HONG KONG, June 7, 2018 - (Media OutReach) - FWD Hong Kong ('FWD') achieved another significant landmark as it became the first-ever Hong Kong insurer to win a prestigious Fintech Initiative Award at the Shenzhen-Hong Kong Fintech Award 2018 (the "Award") for creating a fresh customer experience that customers can arrange instant cash withdrawal from designated insurance plans to their mobile wallet accounts. Amidst fierce competition from numerous Fintech applications showcased by prominent contestants, FWD was able to clinch one of the third prizes in the category thanks to the pioneering nature of its mobile services which it has been embraced by customers. Ken Lau, FWD Managing Director of Greater China and Hong Kong Chief Executive Officer, said: "We are deeply honoured to become the first Hong Kong insurer to win this prestigious award. This recognition of FWD's instant withdrawal method, one of our many InsurTech innovations, not only vindicates our development teams' creativity and hard work, but also confirms that our dedication to challenge the status quo and reshape the industry by offering revolutionary products, services and technology-driven solutions is bearing substantial fruit." FWD's strategic and game-changing partnership with HKT Payment Limited, integrating Tap & Go Payment Service into the iFWD platform, allows customers to arrange instant cash withdrawal services from their Savie Insurance Plan* or Provie Insurance Plan* policies to their Tap & Go accounts at phenomenal speed, anytime, anywhere. Withdrawing cash from an insurance policy traditionally take weeks, and involves burdensome paperwork, the inconvenience of having to submit a request in person or by mail. FWD's innovative mobile services, partnering with Tap & Go, makes it possible to immediately and seamlessly make transfers between a customer's policy and mobile wallet. All transactions are accessible either via FWD or Tap & Go. This InsurTech approach, which derives its power and present-day relevance from the smart application of modern technology, contributes to integrating insurance into everyday life, rather than making it an obscure, slow and tedious experience. It is consistent with FWD's overarching strategy to disrupt traditional industry practices and ultimately change the way people feel about insurance. Jointly organised every year by the Hong Kong Monetary Authority and the development of the Shenzhen Municipal Government Financial Services Office, the cross-border Award recognises and rewards Fintech products and solutions developed by Hong Kong and Shenzhen-based financial institutions. 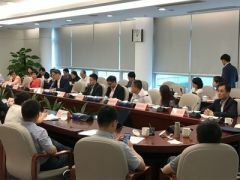 Awards fall into two categories, namely Fintech Initiative Award and Shenzhen-Hong Kong Financial Collaborative Innovative Award. FWD Group spans Hong Kong & Macau, Thailand, Indonesia, the Philippines, Singapore, Vietnam and Japan. In Hong Kong, FWD offers life and medical insurance, general insurance, employee benefits, and financial planning. The life insurance and general insurance operating entities have been assigned strong financial strength ratings by international rating agencies - FWD Life Insurance Company (Bermuda) Limited is rated "A3" by Moody's and "A" by Fitch; and FWD General Insurance Company Limited is rated "A" by Fitch. Hong Kong Monetary Authority and the development of the Shenzhen Municipal Government Financial Services Office organised the 'Shenzhen-Hong Kong Financial Innovation And Collaboration Forum' and met with the winning organisations of the Shenzhen-Hong Kong Fintech Award 2018. 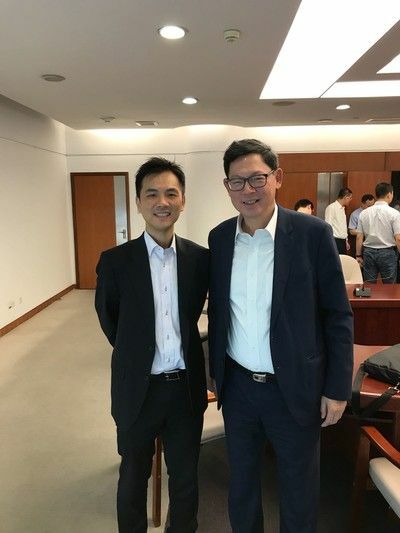 Norman Chan (right), Hong Kong Monetary Authority Chief Executive, and Adrian Leung, FWD Hong Kong Head of Business Development at the Forum.